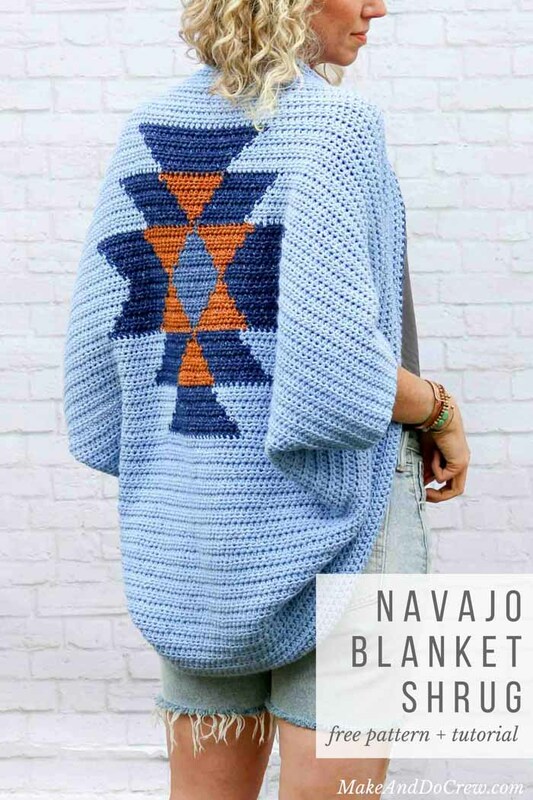 While this free crochet shrug pattern resembles the look of tapestry crochet, its Navajo-blanket-inspired design is actually made by switching colors mid-row using basic crochet techniques! Get the free crochet pattern below or purchase the ad-free, printable PDF with line-by-line graph instructions for $2.75 here. I supposed it was probably my eight-year-old self then that knew the second I laid eyes on this Jeans yarn from Lion Brand that I was going to need to make some kind of southwestern crochet project. It’s no secret that I love boho crochet style and crocheting from graphs, so I decided to try combine the two ideas to sort of “paint” my vision with yarn. 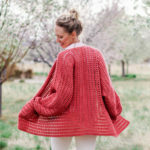 For this free crochet shrug pattern, I was inspired by a very common design that can be found on many southwestern blankets. I’m sure a legit historian would tear me apart for saying this, but to my layman eyes, it looks a little Navajo, slightly tribal, a bit Aztec and a lot like something I want to wear about eight days a week. When I shared a work in progress photo of this free crochet shrug pattern on Instagram, many of you asked it it was tapestry crochet. It’s not! (I don’t even know how to tapestry crochet 🙂 ) This four-season sweater is made entirely with regular old half double crochet stitches. While working on developing this pattern, one thing I knew for sure was that I didn’t want to have 8,000 ends to weave in when I was finished. I’m always too excited to start my next project to bother with anything tedious like that. I’m guessing you might be able to relate? So, in the process of working on this, I learned a lot of lessons about how to change colors without actually cutting your yarn. I created a video tutorial on five quick tips for working the graph section of this pattern and minimizing your ends to weave in–because, you know, fewer ends to weave in means more crochet time. You can find the video below (right above the free pattern). In the printable pattern PDF for this pattern, I’ve included line-by-line written instructions for how many stitches to work in each color. This may be helpful if you aren’t inexperienced in reading a graph, just prefer to have written instructions or like to double check your work because you get lost in Netflix while you crochet. (Me too!) You can purchase the PDF for $2.75 here. 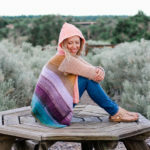 Lion Brand has turned the Navajo Blanket Shrug into a kit that includes all the yarn you need, plus a black and white printed copy of the pattern! You can pick up your kit here. Purchase the printable PDF with optional line-by-line written graph instructions for $2.75 here. This southwestern-inspired shrug uses very simple stitches to achieve a unique end result. While this design resembles the look of tapestry crochet, it’s actually made by switching colors mid-row using basic crochet techniques. The result is quite a showstopper and looks far from DIY-ed. Paired with jeans, leggings or cutoffs, it’ll become your favorite comfy statement piece. 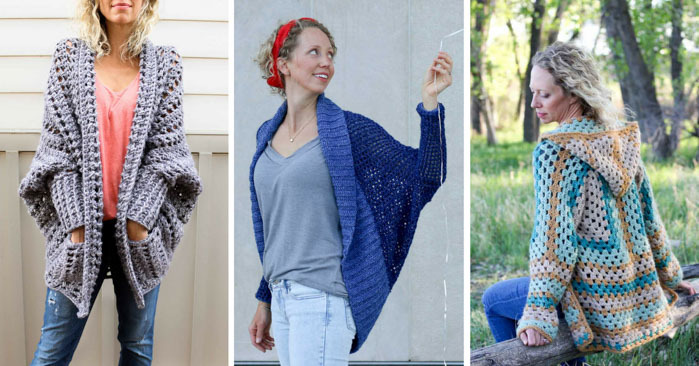 If you’re looking for a mindless project with a bit of magic tossed in the middle, this crochet shrug pattern is for you! Purchase a kit with all the yarn you need, plus a printed copy of the pattern here! • Optional: The printable pattern PDF includes line by line written instructions for how many stitches to work in each color for the graph portion. This may be helpful if you aren’t inexperienced in reading a graph, just prefer to have written instructions or like to double check your work. 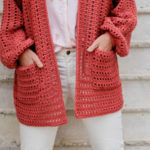 This crochet shrug pattern is written in one size that will accommodate a wide range of body types. To adjust the pattern sizing, see notes below. • This shrug is constructed from one large rectangle worked from the bottom up. 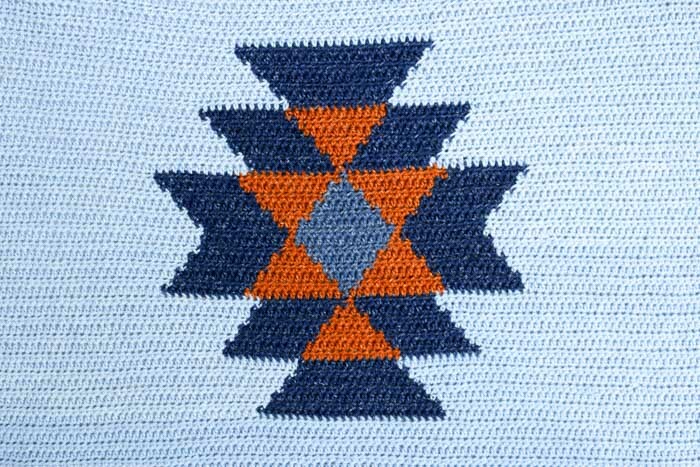 The pattern is divided into three sections: the solid section of “Faded” color before the Navajo design, the Navajo design and the solid section of “Faded” after the Navajo design. • To create a shorter shrug, work fewer rows before and after the design section. Similarly, to create longer shrug, work additional rows before and after the design section. • To create a wider shrug, add additional stitches by increasing the number of chains in the foundation chain. Use an odd number of chains. Take your number of chains and subtract 115. Divide that number by 2. 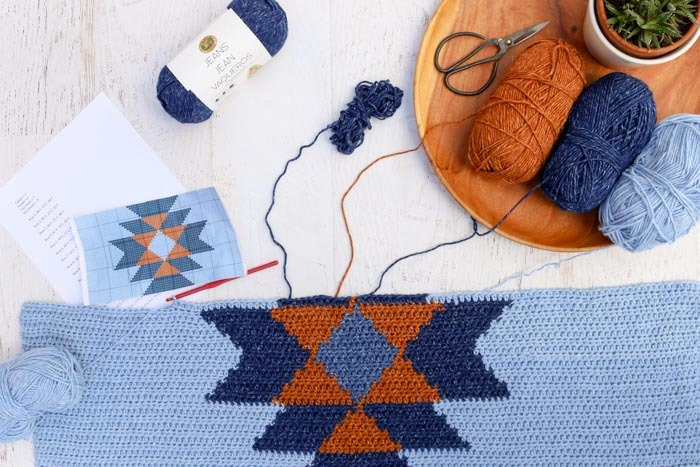 The resulting number is how many extra stitches you should work using Color F before beginning each row of the chart (or written pattern) in the “Navajo Design Section.” This will ensure the Navajo design is perfectly centered width-wise on your shrug. • There will be no difference between the RS and WS in this section of the pattern. Using Color F, rep Row 2 until piece measures 14” (about 40 rows). • Row 1 of this section is now considered a RS row. Row 2 is a WS row, etc. Keep yarn that isn’t being used to the back (WS) of the work as you crochet in order to keep the RS of the design looking as clean as possible. • I’ll be sharing a video tutorial this week that offers all my tips for how to switch colors mid-row without cutting your yarn (which means fewer ends to weave in!) Stay tuned! Work Navajo design graph in it’s entirety using hdc. As described on the graph, be sure to add the necessary 32 stitches in “Faded” yarn (Color F) before you work each line of the graph. The printable pattern PDF includes line by line written instructions for how many stitches to work in each color. This may be helpful if you aren’t inexperienced in reading a graph, just prefer to have written instructions or like to double check your work. You can purchase the PDF for $2.75 here. Using Color F, rep Row 1 until the section above the design measures 6.5” (about 19 rows). The total length of the piece should measure approx. 34” at this point. With RS facing out, fold rectangle so that the original foundation chain is touching the last row you worked. Pin each side of the rectangle together with safety pins or stitch markers. With a tapestry needle and a doubled-over length of Color F yarn, seam 10” along the side seam, leaving an 8” armhole. (Begin at the corners and work toward what will be the armhole.) Repeat for second side. Attach Color C in middle of top of shrug, near the neck. Round 1: Ch 2, hdc in same hdc yarn attached in, hdc in each hdc around shrug, sl st to first hdc of round to join. Do not turn. Fasten off Color C. Attach Color F in near back of neck. Using Color T, rep Round 1. 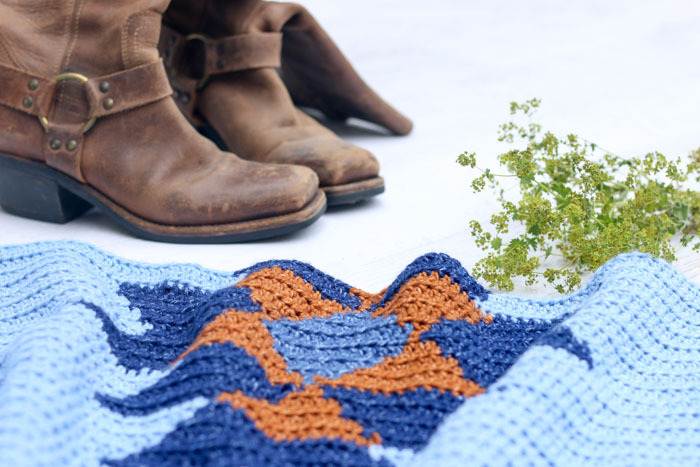 Hey you, Picasso, you just painted your own southwestern masterpiece entirely with yarn! This probably deserves a night on the town and a new pair of moccasins! I felt I needed to let you know that when I got your newsletter about your Navajo Blanket Shrug, every link in that email I clicked on I received a block from my Symantec and it would not allow me to use any of the links. I had to type and come directly to you page. Just thought you might want to know. I’m just so glad I could get here for the pattern! Thank you so much. Have a Blessed day! I love this! All of your designs are so beautiful! Can’t wait to try the “jeans” yarn! Thank you so much, Mary. I just love this Jeans yarn. It’s so soft and drapey and especially perfect for a cozy shrug like this. Jess, I love your patterns, and just did the campfire sweater before a trip to Europe and was able to take it with. So now I’m working this one, but I’m concerned that I am crocheting through both loops of the hdc and shouldn’t be? 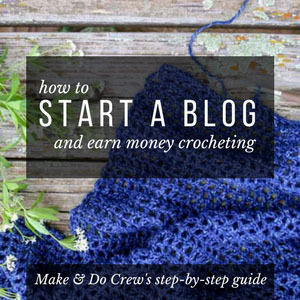 I can’t find if the pattern says to do that…I think it says to crochet IN the hdc? Do you know what I mean and can you clarify. Crocheting through both loops seems thick and it doesn’t look like that’s what it is suppose to look like? Thanks. Great question about the hdc. It is actually just worked like any old half double crochet, so you are working through the two back-ish loops. That should leave one little loop that will create a slight ridge in the fabric, evenly on both sides of the fabric. Hi Jesse, I love your patterns and have ordered four of them. I am just starting the first one, theNavajo blanket shrug, and I have what may appear to be a stupid question… Is the first chain 2 counted as a hdc? If so, I have 114 stitches in my foundation row instead of 113. Or is it merely a turning chain followed by 113 hdc’s? Please don’t cpost this on your blog. But do reply quickly! I want to get to work on this project! Thanks and happy crocheting! Hi, Jess! I sent an earlier inquiry but I don’t see it here today. I need a good graph page to print the pattern. The one within the instructions is barely readable. Reading line by line while trying to work with the impossibly splitting yarn is making me crazy! I’m trying to finish this shrug asap but I’m having a devil of a time. That sounds annoying! I’m so sorry you’re having trouble seeing it. If you’d like to email me at jess (at) makeanddocrew (dot) com, I can send you the highest resolution version I have. Perhaps that would help? Hi I thought you should know there’s a etsy seller selling your pattern as a blanket for 5.50 @ mydearknot. I hate when people steal other artist work. Thanks so much for looking out for me and my work! I’ll check into it. I really appreciate people like you! For the edging, you wrote to finish the shrug with color C – Classic, but the pictures show color T – Topstitch. Was this a typo or am I actually supposed to use color C? Thanks Jess! I think there’s a typo in the pattern – it says to use Classic and then Faded to finish off the shawl. You’re right! Thanks for catching that. 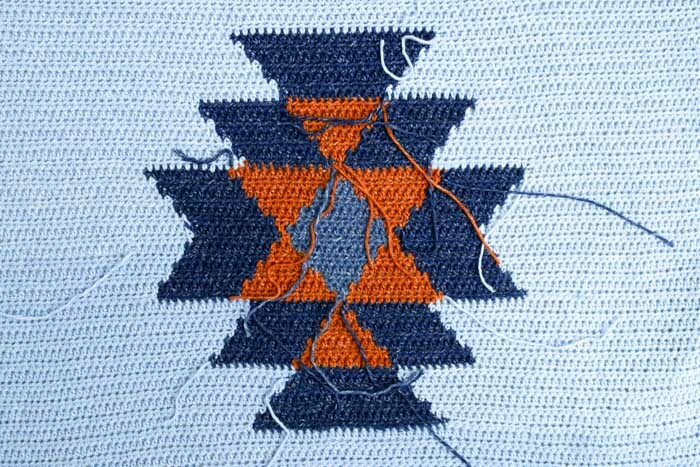 It should end with Color T (top stitch). shrug pattern, just love the “jean” yarn, so soft. 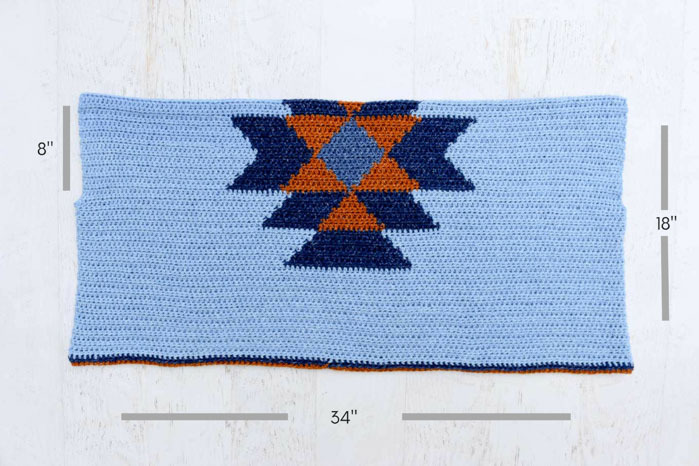 I have a question, I have my 113 hdc and I have 20 rows completed, but when I measured the width I only have 27″, not 34″ like the pattern indicates, what could my problem be? Have a bad feeling I might have to redo my 20 rows. Thanks Jess for your help, as I really want to complete my project the right way. I am trying to Create a wider shrug to increas the number of chains to xlarge I get .05 is that right? What are you getting .05 for? Is that a number of inches or stitches? Let me know a few more details and I’m happy to help! Thank you so much for sharing this pattern. I just ordered all the yarn to make this shrug. Although, I couldnt find “Classic” in stock anywhere so I had to go with “Brand New” instead. It looks like a darker version and I think it will still look great! I just started the shrug and this is my 1st time using the Jeans yarn. I must say, I am in love with the look and feel of this stuff 😀 it is so soft and it can be compared to some of the more expensive yarn I’ve used and bought for $30 a hank!! Thanks again…oh yeah I almost forgot, I bought extra yarn so I can make a matching bag for this so if you have any ideas or designs you think might match this bag with the Jeans yarn, I would be most grateful to you! I dont expect you to make a pattern just for me lol. I just meant maybe you already have one onljne and can point me in the right direction. Thank you so much! Love your pattern,wGoing to try it this afternoon. I wear a plus size shirt.i have increased my wool size Charisma5 and my hook size to a 6mm do you think this is enough for a loose fitting Scrug? HI, i got the pattern and the yarn, but the blak and white picture does not show enough detail. Saw the color photo, great. Sure, Lucie! You can find the graph here. What a sweet friend to make this for you! Hmm. Let’s see. The intent is to fold it in half so that the rows of crocheting are running horizontally (the same way as the fold). Then starting at either of the two corners that are touching, you’ll sew toward the fold until just the space for the armhole remains. Then you’ll repeat that same side on the other seam. thank you so much for your response! I feel super silly, I sewed it wrong. You are so awesome and I love your patterns! I am making this for my 11 year old. She fell in love with this pattern!